Jeff Mugerian had a decision to make. Should he sink $5,000 into a mutual fund or put his money where his heart is: Baseball cards? He is referring to cards like Mugerian purchased from the 1930s, a Goudey gum card. During the 1930s and ’40s, other companies like Diamond Star, Play Ball and DeLongs produced cards. Before that, tobacco cards were produced at the turn of the century and into the 1920s. Bowman baseball began producing cards in 1948 and then Topps, which still produces cards today, began production in 1952 and knocked Bowman out of business after 1955.“There are still people alive who collected cards in the 1930s and ’40s,” said Porter. “To them, the players from that era were tough, good guys – not the spoiled brats they read about today. 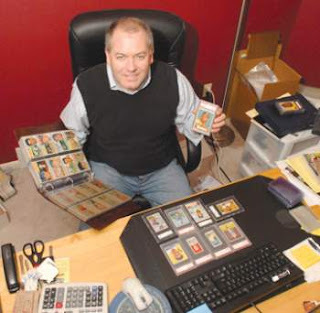 There are still collections of those cards out there.”Porter’s job is to uncover them and bring them to the open market.“Baseball cards can go through price fluctuations like anything else,” he said. “Some values will hit a plateau, go flat, then spike up again. But star cards that have high professional grades have never had an extended period of loss of value.”Mugerian likes the idea of investing in quality baseball cards and sports memorabilia.“I think investing in anything that is in demand, vintage and in great condition is a wise idea,” he said. “With the stock market, it’s always possible in this economy that your money will erode or disappear. With sports memorabilia, there are fewer collectors in a bad economy, but the collectors will never simply vanish and you will always still be physically holding your investments in hand.”Mugerian believes his return on investment is well worth the risk.“Not only do I see high-end stuff hold its value, but the rate of return can be astronomical,” he said. “I remember sitting in a hotel ballroom in New York City during a Leland’s auction. A particular baseball was up for sale and the auction house was estimating a $5,000 to $10,000 price. What Leland’s didn’t know was that two heavy hitters were planning on owning this baseball, including actor Charlie Sheen. After many minutes of spirited bidding, the ball sold for $105,000. With quality vintage items, the sky can be the limit.”But Mugerian, who started collecting cards in 1975, echoes Porter’s assessment that people who do their homework have the best shot at making money with their baseball card investments. They look a little crude today. Black and white photos. Dated fonts on the back and some printing errors. 70 years after they first hit the market, though, the 1939 Play Ball set has stood the test of time. In fact, the 161-card set was a bit revolutionary. While photos of some earlier issues were often dark, grainy or distorted, the Play Ball cards kids pulled out of gum packs were pretty clear. Advances in photography following the Depression had changed the landscape. Magazines like LIFE brought world events home through those modern images. Americans, no matter where they lived, were seeing things in a much clearer light. Baseball was celebrating its centennial year in 1939 and Gum, Inc., based in Philadelphia took the bull by the horns to become the only card manufacturer in '39. Goudey Gum had basically disappeared by then, and was four years removed from any large scale offering it had made. Play Ball cards were also unique in that baseball cards had not only grown up, but grown in size at 2 1/2" x 3 1/8". It allowed for extensive write-ups on the back--even the use of the players' full names. Kids may have learned for the first time that their favorite player was "Joseph Paul DiMaggio Jr." and Ted Williams was "Theodore Samuel Williams". We can only surmise the number of playground bets that were won and lost. There may have been some confusion, too, for the aggressive youngsters who tried to collect a complete set. At the bottom of each card's back was an advertisement that stated there were 250 cards in the set. By the time Gum Inc. had finished production, there were only 161 subjects. 162 cards had been numbered but #126 was never issued. There were two series issued and the high numbers are decidedly harder to come by. #1-115 are usually $20 and under in mid-to-high grade. Commons from #116-152 are twice that and more. The key cards in the set include the Williams rookie card (#92), which commonly sells for $2,000 and up in higher grade, and DiMaggio (#26), just coming into his own as a Yankee. 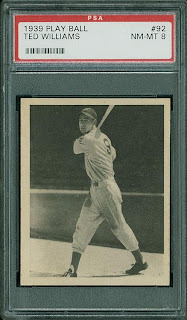 Expect to pay $1,000 or more for a high quality DiMaggio, many times that for a graded NM or Mint copy. Both are high on collectors' want lists. There are also a number of Hall of Famers including Leo Durocher, Bill Dickey, Lefty Gomez, Charlie Gehringer, Mel Ott, Hank Greenberg and the Waner brothers. Another popular card is the 'rookie' card of catcher Moe Berg. A journeyman player, Berg gained fame for his work as a spy for the United States leading up to World War II. Berg's card can run over $100, despite his profound lack of Hall of Fame credentials as a player. There are variations throughout the set, including a number of first series cards which have the player's name in all capital letters or upper and lower case, which many consider to be more scarce. A complete set of 1939 Play Ball cards will cost anywhere from $4,000 to $10,000 in mid to high grade. Completely graded sets will run higher, while lower grade sets can be had for less.Play Ball would last just three years. An extensive set of modern and retired players was issued in 1940, followed by a color set in 1941 that included only 72 cards. War was approaching and paper conservation meant few cards of any kind were produced until the late 1940s. The Honus Wagner T206 is considered by collectors to be the "Holy Grail" or "Mona Lisa" of all baseball cards. There are only 50 to 60 believed to be in existence and the card has broken a number of records including:- First baseball card to be professional graded by the PSA (Professional Sports Authenticator). The card shown on the left is marked #00000001- First baseball card to sell for over $1 million- Highest priced baseball card available, currently valued at $2.8 millionHere is a history as to how the Honus Wagner T206 PSA 8 came to be worth so much money. In the 1930s, according to baseball card catalogues, the Honus Wagner T206 cards were listed at a value of $50. Other T206 cards were valued at 35 cents making the Wagners a premium. Nobody, however, could have predicted that the card would come to be worth millions over 70 years later. The Honus Wagner T206 made its first appearance in the modern world of sports card collecting in 1985 when Alan Ray, a small time card collector, went to see Bob Sevchuk who owned a New York based sports memorabilia store where Ray was a regular customer.Ray was hoping to sell his Honus Wagner T206 for $25,000 to Sevchuk. Bill Mastro, another sports memorabilia store owner and future founder of Mastro Auctions, caught wind of the card's availability and expressed an interest in buying it. He drove to Sevchuk's store and agreed to buy the card from Ray but only if he threw in the other 50 to 75 T206's that Ray had brought along as well. Ray made the deal, later saying "I had a money situation. I had to sell the card"The origins of the card still remain a mystery and have never been disclosed. Ray has only said in 2001 that he received the card from a relative, whose name he did not divulge. In 1987, Mastro contacted Jim Copeland, a sporting goods chain owner in California, and sold him the card for $110,000, realizing a $85,000 profit in under two years. "I called from the airport in California," Mastro says, "and ordered a Mercedes Benz. "The sale sparked a renewed interest in baseball card collecting and created an incentive for people to find and sell their cards from the T206 series. In 1991, Copeland decided that he wanted to sell his collection of 873 pieces in a single sale. He contacted Mastro to help him sell the card. Mastro contacted Sotheby's, one of the most well known auction house in the world, to arrange the sale. Over 800 collectors showed up and the Honus Wagner T206 was expected to go for $114,000 according to pre-auction estimates.Within minutes of opening the card soared past $228,000, double the original pre-auction estimate. There were three bidders for the card: Mike Gidwitz, Mark Friedland, and an unknown phone bidder. Gidwitz dropped out when the price hit $300,000. Friedland pursued and found that with each successive price increase he made, the anonymous phone bidder would further raise $5,000 or $10,000. Friedland finally called it off when the price hit $410,000. Sotheby's took at 10% buyer's premium on the value of the card so the final sales price was $451,000. It was later discovered that the anonymous phone bidder was none other than NHL hockey great Wayne Gretzky who bid on the card with the financial support of Los Angeles Kings owner Bruce McNall. Mastro continued to work for Sotheby's for the next 5 years to facilitate the sale of expensive sports memorabilia and thereby establishing himself as the expert in the industry.Gretzky, not known at the time for being a card collector, thought it would make a good investment and that "the market would remain strong. Still, my dad told me I was an idiot for paying $450,000 for a baseball card." According to his co-owner McNall, "If you buy something that is absolutely the best in the world, you'd be okay because there is always another buyer for something at the top end. "The record-setting purchase made headlines and the card quickly became known as the "Gretzky T206 Wagner." To validate its authenticity, the Professional Sports Authenticators (PSA) chose the card to be the first that it would grade. The card received a PSA 8 - NM-MT (near mind to mint), the highest grade so far awarded to a Honus Wagner T206 baseball card. PSA President David Hall called it "superb" and a "fantastic card in every way." 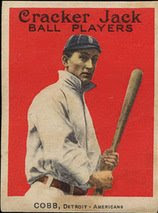 Shortly after the PSA graded the Honus Wagner T206, Bruce McNall became the subject of a federal investigation for fraud. He was later charged in 1994 for defrauding 6 banks of more than $236 million. With his partner off to a start a 70 month prison sentence, Gretzky decided to buy him out for his share and put the card back on the auction block.In 1995, the Honus Wagner T206 was sold to Wal-Mart and Treat Entertainment for $500,000. The companies wanted to use the card as the top prize in a promotional campaign to raise awareness about the baseball card products that Wal-Mart was selling. As part of the contest, the card traveled all across the United States and on February 24th, 1996, the 122nd anniversary of Honus Wagner's birthday, the T206 prize winner was chosen in a random draw made by Brooks Robinson on an episode of CNN's Larry King Weekend. The winner was Patricia Gibbs, a postal worker from Florida.Gibbs could not afford the taxes on the Honus Wagner T206 so she put it up for auction with Christie's, another New York auction house. Wal-Mart benefited heavily from the exposure and sold more than 30 million packs of baseball cards in a matter of months. 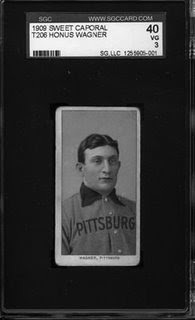 The Honus Wagner T206 went to auction in 1996 and the top bidder was a familiar name, Michael Gidwitz, one of the men who battled Wayne Gretzky for the card in 1991 and lost. Bill Mastro was also bidding for the card but lost out this time to Gidwitz. According to Mastro, "No one ever wants to separate themselves from the crown jewel of the hobby. "Gidwitz, a Chicago based collector, had to pay a significant premium over the $451,000 1991 price tag. He ended up spending $641,500 to acquire the card in 1996. After owning the Honus Wagner T206 for four years, Gidwitz decided it was time to sell. Instead of approaching a brand name auction house, he used technology to his advantage and made a deal with the largest online auction company in the world: eBay. Gidwitz partnered with Robert Edwards Auctions, a division of MastroNet, to create a 10 day auction for the card. Prospective bidders had to wire a $100,000 deposit to iEscrow.com to be pre-approved to enter the auction. According to Robert Lifson, director of Robert Edwards Auctions, "I was thinking how could I leverage the publicity value of this card. I thought it would be really something if I approached eBay with this idea." On July 15th of 2000 the Honus Wagner T206 was sold on eBay to Brian Seigel, a California collector for a record $1,265,000. This was a the first time that a baseball card had sold for more than $1 million. At the time Seigel said "Some day I'll sell it. I guess when I get tired of it. But this was not a business move. I am a collector." In February 2007, however, Seigel decided that it was indeed time to move on and the card was sold again, this time to an anonymous California buyer via SCP Auctions for $2,350,000. According to SCP President David Kohler, the new owner said "'Let's let the world know and have a news conference, but I don't want my name out there.' We have to respect that." Finally, on September 6th, 2007 the Honus Wagner T206 it was sold most recently to another anonymous collector for a record $2,800,000. It is rumored that the card will be put on display at a number of upcoming conventions and events.Who the owner is and when the famed card will next go on sale is anyone's guess. Only time will tell how high the price Honus Wagner T206 can go. October 2008 Update: It was recently revealed that the current owner of the famous Honus Wagner T206 is E.G. "Ken" Kendrick, managing general partner of the Arizona Diamondbacks baseball team. Kendrick is a veteran collector and is believed to be creating a sports museum at Chase Field where the card will be put on display. The sale of the PSA 1 Honus Wagner card in Robert Edward Auctions' 2009 spring event established yet another bar for the card that every collector would love to own. Never mind the fact that there are many other vintage cards that are actually more scarce, the Wagner remains the hobby's holy grail. Most of us will have to be happy with a reprint, but we can appreciate...well...the appreciation in recent years. The economic slowdown hasn't hurt sales of Wagner cards at all--and there has been more than one available. The lower grade Wagner will surely make John Rogers happy. He's the Arkansas collector who plunked down $1.62 million for a PSA 5 copy last summer. The latest information should elevate the value of all Wagner cards. Rookie cards are the crown jewel of collecting. Naturally, the best rookie cards belong to Hall of Fame players. Here is our list of best investment rookie cards for your money (all under $1000 each). 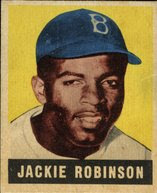 1) 1948-49 Leaf Jackie Robinson: No one changed the game like Jackie. Both as a presence on and off the field. Buy one of these and you'll feel like you're starting a museum. 2) 1948 Bowman Yogi Berra: His phrases are famous, but his play was even better. A three time MVP and a record 10 World Series Rings. A true baseball icon. 3) 1954 Topps Ernie Banks: Mr. Cub's rookie from this beautiful set. He represents the spirit of the Cubs more than any other player. 4) 1955 Topps Sandy Koufax: A short career, but completely dominant. The "left arm of God," as referred to by those who faced him. 5) 1954 Topps Hank Aaron: The All-Time Home Run King! No steroids. Enough said. 6) 1957 Topps Frank Robinson: The only player to win an MVP in both leagues. Robinson would also become baseball's first African-American Manager. 7) 1958 Topps Roger Maris: Although he's not a Hall of Famer, Maris was pure Yankee class. His 61 homeruns in 1961 continue to have meaning in light of today's steroids scandals. 8) 1963 Topps Pete Rose: Although Rose ruined his reputation after he played, the All-Time Hits Leader's cards continue to maintain a steady value. He will never be forgotten by fans who recall his amazing longevity and love for the game. 9) 1968 Topps Nolan Ryan: Ryan is larger than life. Over 5,700 strikouts and a record 7 No-Hitters! Collecting the Ryan Express' Rookie card is a true investment. 10) 1969 Topps Reggie Jackson: The rookie card of "Mr. October" continues to be a favorite among collectors. They tempt you with history..tantalize you with scarcity and have a 'coolness factor' that's off the charts. The 1914 and 1915 Cracker Jack baseball sets are among the most popular of all time. They're also among the most expensive. But if you're going to collect one of the two, the latter version might be the way to go. The two sets are nearly identical, sharing the same basic style, size (2 1/4" x 3") and many of the same subjects. There are 176 cards in the 1915 set; up from 144 the year before. The 1914 Cracker Jack cards are tougher to locate, especially in high grade. Putting together even half a set can take years unless you're wealthy enough to find a dealer with a huge stock and buy a large lot at once. Because of the scarcity, many collectors prefer the 1915 Cracker Jacks. Known as E145, the 1915 set can be distinguished from the '14 issue by references on the back to the number of cards in the set. Also, the backs of the 1915 issue are printed in the opposite direction of the picture on the front. The card stock on which the cards were printed is heavier in 1915, making the cards less prone to creasing and wear. There are several variations among the players who appear in both sets. One popular difference are the cards featuring Christy Mathewson. The 1914 version shows him pitching while the 1915 Matty is a portrait shot.Cards from both sets are pricey, but 1915 Cracker Jack common cards can be found in respectable VG condition for well under $100. Some Hall of Famers in the same grade will run $200-300. Among the most expensive are the Joe Jackson, Honus Wagner, Christy Mathewson and Ty Cobb which will often cost $2,000-5000 even in lower grade; Grover Cleveland Alexander, which is rarely found for less than $1000, plus the Tris Speaker and Nap Lajoie. The last 31 cards in the 1915 set are a little more expensive than the first 144. Clark Griffith and Edd Roush (spelled Rousch in the set) highlight the high number run. The 1915 Cracker Jack cards are more plentiful thanks in large part to a company offer that allowed youngsters to send in for a complete set and collector's album. Such an offer wasn't available in 1914. There was also a significant find of the '15 cards several years ago, which has also kept supply at strong enough levels to keep prices from skyrocketing.Dripping with Hall of Famers and history, the 1915 Cracker Jack set is a worthwhile investment, even if you can only own a small number of the cards that helped America embrace baseball.